Herbs, perennial, to 100 cm; rhizomes absent; stolons present; corms present. Leaves emersed; petiole 5-ridged, ascending to erect, 24.5--60 cm; blade sagittate, 11.5--26.5 ´ 0.8--15 cm, basal lobes longer than remainder of blade. Inflorescences racemes, rarely panicles, of 5--17 whorls, emersed, 20--37 ´ 5--27 cm; peduncles 25--96 cm; bracts connate more than or equal to ¼ total length, lanceolate, 6.5--15 mm, delicate, not papillose; fruiting pedicels spreading, cylindric, 1.5--4.4 cm. Flowers to 3 cm diam. ; sepals recurved to spreading, not enclosing flower; filaments cylindric, shorter than anthers, glabrous; pistillate flowers pedicellate, without ring of sterile stamens. Fruiting heads 0.9--1.5 cm diam; achenes oblanceoloid, abaxially keeled, 1.2--2.5 ´ 0.8--1.6 mm, beaked; faces tuberculate, wings absent, glands 0--1; beak lateral, erect, 0.1--0.6 mm. Flowering summer--fall. Wet ditches, ephermeral pools, and margins of streams and lakes; 0--300 m; Ariz., Calif., Kans., Nebr., Okla., Tex. ; Mexico; Central America (Nicaragua). 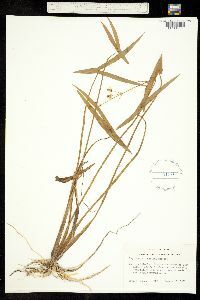 Duration: Perennial Nativity: Native Lifeform: Forb/Herb General: Aquatic herbaceous perennials, with leaves that are submersed, floating, emersed, or on mud; stems to 100 cm tall, flowering scapes generally straight and erect at the inflorescence; herbage glabrous to sparsely pubescent; with stolons and tan, spheric tubers (corms). Leaves: Morphology varies based on leaf position. Submersed blades are tapered to the base; floating or emergent blades sagittate or rarely linear to ovate, 10-30 cm long and 1-15 cm wide, the basal lobes more than twice as long as the terminal lobe, the terminal lobe linear to lanceolate, usually long-acuminate; blades sessile or petiolate; petioles 5-ridged, ascending to erect, 25-60 cm long. Flowers: White or pink, in emersed (emerging from the water) racemes of 5-17 whorls, 20-40 cm long and 5-30 cm wide, atop ascending to erect scapes 25-100 cm long; flowers pedicillate, 3 cm in diameter, radial with 3 petals, these larger than the 3 green, persistant, recurved or spreading sepals; subtended by delicate, lanceolate bracts 6-15 mm, which are connate for at least 1/4 of their length; flowers unisexual, male and female flowers found on the same plant; pistillate flowers with many pistils spiralled on the convex receptacle, lacking a ring of sterile stamens; staminate flowers have 7-30 stamens with short, glabrous, cylindric filaments that are shorter than the anthers. Fruits: Fruiting heads 1-1.5 cm in diameter on spreading, cylindric 1-4 cm pedicels; achenes tuberculate, tan, oblanceoloid and abaxially keeled, 1-2 mm long by 1 mm wide, with an erect beak, and with or without a single gland. Ecology: Found in wet ditches, ponds, rice fields, ephemeral pools, margins of streams and lakes, or on mud, from 0-4,000 ft (0-1219 m); flowering summer-fall. Distribution: Arizona, California, Kansas, Nebraska, Oklahoma, Texas; Mexico. Notes: The long, saggitate leaves with narrow lobes are distinctive and make the species conspicuous in wetted areas. The keys to this species are the leaves with basal lobes much longer than the terminal lobes, to 27 cm long, the terminal lobes linear to lanceolate and long-acuminate, and the tan achenes without wings. Ethnobotany: Unknown, but other species in the genus have uses. Synonyms: Sagittaria greggii Editor: LCrumbacher2012, AHazelton 2015 Etymology: Sagittaria comes from the Latin sagitta, "arrow," because of the leaf shape; longiloba means long-lobed, also referring to the leaf shape.